Sigma has taken the wraps off three impressively large high-end lenses at Photokina and we went along to meet Sigma Imaging UK’s product specialist, Paul Reynolds, to get the low down on them. The three lenses are the SIGMA 12-24mm F4 DG OS HSM A | Art, SIGMA 500mm F4 DG OS HSM S | Sports and the SIGMA 85mm F1.4 DG HSM A | Art. Lens mount supported include Sigma’s SD mount, Nikon and Canon. 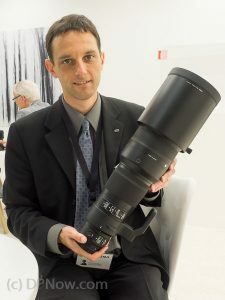 The biggest and the baddest, in the nicest sense, is the 500mm f/4. It’s huge but deceptively light thanks to its largely magnesium alloy casing and carbon fibre lens hood. This is a lens that just begs to be plugged into your computer via Sigma’s USB dock. You don’t just update the firmware via USB any more. The 500 f/4 can be programmed to your focus limit distance preferences, which can be recalled when needed by pressing a button on the lens exactly when you need to use it. In fact there are two separate configuration panels on the lens for focusing, stabilisation and even focus beep options. The OIS can now detect when you are panning vertically as well as horizontally and adjust compensation correspondingly. There are further fine detail niceties with the 500 f/4, like the ability to enable or disable click-stops on the rotating tripod collar. Two sizes of tripod collar foot are also available, the optional one being Arca Swiss plate-ready. Paul tells me the 500 f/4 will deliver class-leading optical performance and from the look if this lens we have absolutely no grounds to doubt him. That classic 85mm f/1.4 specification is not new to Sigma and has been a popular choice in its EX form but the new Art version launched this week is a complete redesign. There is no short-cut to optimum image quality when it comes to the size of the glass elements that constitute the optical design. This means the Art version of this lens is noticeably larger than the EX version. It also has a higher-torque focus motor to maintain focus responsiveness. Again Paul tells us this will prove to be an outstanding optical performer, especially in the area of defocused bokeh. Like all three lenses announced this week, the 85 1.4 Art is splash and dust-proofed. Last but not least, is the 12-24mm f/4 Art. Like the 85, this is not a lens for those seeking compact dimensions over ultimate image quality. A massive domed front element, Sigma’s largest moulded aspherical element yet, dominates the front of the lens. The sheer size of the lens is necessitated to enable the optical design to iron out almost all geometric distortions. It goes without saying that the lens is dust and splash-proofed. Don’t forget we’re keen to hear what you think of Sigma’s new glassware – comments below are most welcome!